OUR MISSION IS AN HONORABLE ONE. Veterans On Their Road To Self-Sustainability." Our evidence-based Housing First Model provides safe housing as soon as possible to veterans, insuring that basic human needs are met so that wrap around services can be more effective. Homeless veterans need an interwoven approach that provides a safety net of housing, meals, health care, substance abuse and mental health treatment, and after care in addition to job assessment, training and placement assistance. We offer these services in an evidenced based continuum of care. Our ultimate goal is to provide a caring, supportive environment that allows veterans to rebuild their lives by returning the dignity lost to the circumstances that left them homeless. There shouldn't be any questions of pre-existing conditions in order to receive services that every homeless veteran deserves. 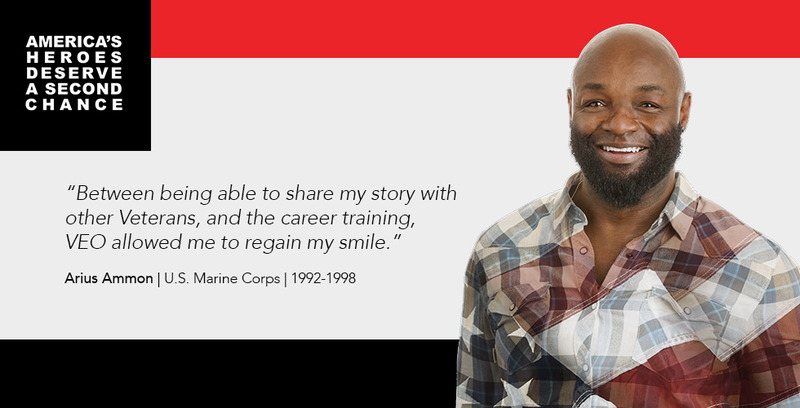 At VEO, our only requirements are that you be a veteran in need of support - and that's it. Through VEO's programs, families are reunited, mental health issues are identified and treated, stable housing is secured, living wage employment is secured, income is increased, and veteran's benefits are accessed. "Government money, while important, is limited, and available services are often at capacity. It is critical, therefore, that community groups reach out to help provide the support, resources and opportunities that most Americans take for granted: housing, employment and health care. Veterans who participate in collaborative programs are afforded more services and have higher chances of becoming tax-paying, productive citizens again." Since 2008, Veterans Empowerment Organization (VEO) has provided Housing, Supportive Services, Job Training and Placement to over 5,000 homeless veterans and their families. Being homeless means having no place to save the things that connect you to your past, losing all contact with friends and family, and uprooting your children from school. It means suffering the frustration and degradation of living hand to mouth, depending on the generosity of strangers or efficiency of a government agency for your survival, and for your family’s survival. In addition to the complex set of factors influencing all homelessness – extreme shortage of affordable housing, livable income and access to health care – a large number of displaced and at-risk veterans live with the lingering effects of post-traumatic stress disorder (PTSD) , TBI, and substance abuse, which are compounded by a lack of family and social support networks. We have had many successful graduates complete our program and moved on to be productive members of the community. We are so proud of their hard work and dedication to become self-sufficient.